Citizens’ Media TV has received a new letter by Epic Environmental, as delivered to Pinelands Regional School District on September 29th (download PDF [15 MB]). It appears that this letter has yet to be shared with the public. As of the morning of Tuesday, December 19th, 2017, it is not posted on the district website. As a follow-up. Epic collected additional air samples for asbestos and total dust on September 11. 2017 in the areas below the asbestos roofing. No asbestos was detected in the air samples collected, and total airborne dust levels were below the method detection limit. It would be more accurate, however, to say that Stephen Brennan was told twice. Brennan serves as the district’s Business Administrator, records custodian, and Board Secretary. He was the sole recipient of September 10th letter and likely the only recipient of the September 29th letter. Most parents did not know about the September 10th letter until October 3rd, when one of them posted about it on Facebook. The superintendent and the majority of the elected Board members were not aware of the September 10th letter until they saw that Facebook post. In other words, the September 29th letter probably arrived before anyone knew that the September 10th letter existed. TTI‘s Jim Guilardi stated at the October 2nd Board meeting that TTI had only been on the job for a week at that point. This means that Epic was likely no longer involved in the project at the time their letter was delivered. An “altered” version of the September 10th letter was distributed by New Road Construction’s Chuck Romanoli at the November 14th private construction meeting. The altered version was also dated September 10th but did not contain the urgent recommendations from the original (that rooftop activity cease immediately and routine testing continue).The author of the September 10th letter, Epic Environmental‘s Jim Eberts, confirmed that the altered version was actually one of the many proposed drafts being considered before the final version was submitted to the district. 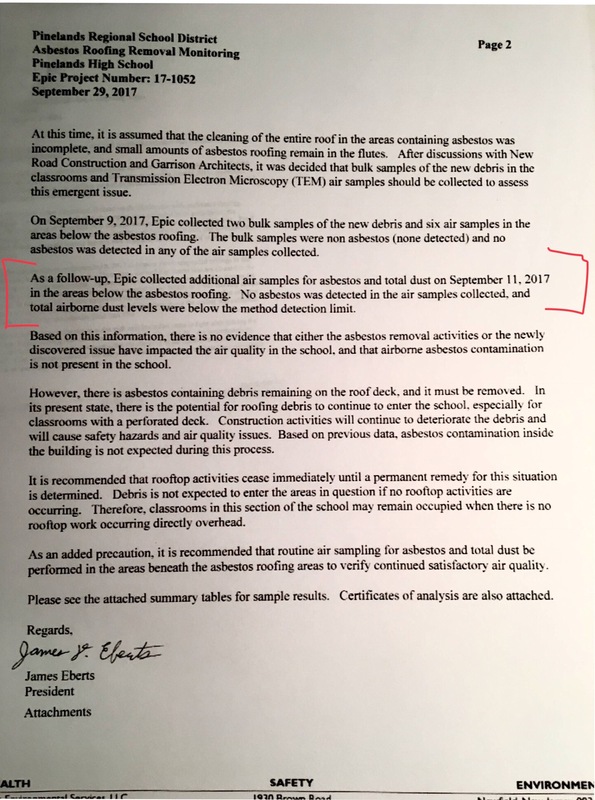 The September 29th version, also authored by Eberts, is obviously dated differently, does indeed contain those recommendations, and contains a small amount of new information (the asbestos tests). To determine why this new letter not shared with the public, we contacted Administrator Brennan, every elected member of the Board of Education, and Acting Superintendent Cheryl Stevenson. We also contacted the author of the letter, Epic’s Jim Eberts. We have not yet received any response.